Any structure consists of two parts – the sub-structure and the super-structure. The sub-structure transmits the load of super-structure to the underlying soil and is known as Foundation. To distribute the load of structure on large area so that intensity of load does not exceed the safe bearing capacity of the underlying soil. To distribute the load evenly on the underlying soil so that there is no unequal settlement of foundation. To provide levelled and hard surface for the super-structure to be built over it. To increase the stability of the structure as a whole against sliding, overturning or other disturbing forces like wind, rain, earthquake etc. 1. Shallow foundation: When the depth of the foundation is less than or equal to its width, it is call Shallow foundation. In other words, if foundation is constructed at reasonable shallow depth, it is termed as Shallow foundation. 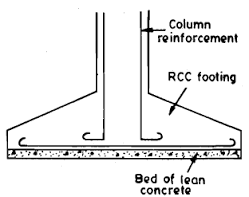 Shallow foundations are commonly adopted in construction of low rise structures. 2. Deep foundation: When the depth of the foundation is greater than its width, it is call Deep foundation. In other words, if foundation is constructed at comparatively large depth, it is termed as Deep foundation. Deep foundation is used for construction of high rise or multi-storey structures.